The Netherlands is notorious for its painkiller-free home births. 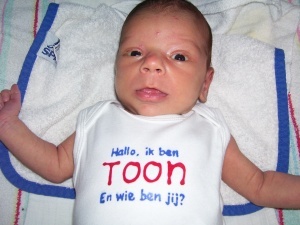 But there are lot of other essential things you need to know to make sure you have a baby the Dutch way. We’ll get this out of the way first. You can have your baby in a hospital. A generation ago, 60% of the Dutch were born at home but that has now dropped to around 20%. There are all sorts of reasons for this – complicated calculations about perinatal death rates, local hospital closures, changing fashions – but we like to think having the option of pain relief might also play a role. The Dutch think pain is part of the process, which it is, but it is also a part which many of us would like to be able to avoid. The is one thing nobody tells you about a home birth. What happens to the placenta? If you are a bit of an earth mother you can always eat it, but if you are not, the midwife will present it to you in a plastic bag to put out with the other rubbish. Seriously. When Dutch women have a baby a kraamverzorgster comes to their home for a week or so to help her with the new-born. This is an amazing institution (paid for by health insurance). Help with breastfeeding, nappies, bathing, pouring cups of coffee for the people who come to coo over little Daan or Emma, she does it all. The kraamverzorgster may well be the reason new dads in the Netherlands are only allowed a couple of days unpaid leave. Not only has he been usurped by the new baby, but the nurse is doing all the other leaky stuff. By law, the arrival of your offspring has to be reported to officialdom within three days. Either a parent or someone else who witnessed the event is supposed to do this. Your baby will then get a birth certificate and its very own BSN – burgerservicenummer – the key to all things official in the Netherlands. If you are not married and foreign it may be complicated to get the dad’s name on the official documents. We have heard too many horror stories and suggest you ask a lawyer. The most popular names in the Netherlands in 2013 were Sem and Tess, which overtook long time faves Emma and Daan. But do not think you are free to name your child just any old thing. Oh no. There are rules about this. According to the government’s website – it should not be a swear word, a name which can open the child to ridicule or a combination of lots of names. And the civil servant behind the counter can refuse to accept the name if he thinks it not suitable. We wonder if civil servants were sleeping last year when they approved the registration of little Ridley-Scott, Alpacino and Lexus. Your child may take either the mother or father’s surname but not both. Despite this discouragement of doubled-barrelled names, there is a Dutch government minister whose surname is the four-barrelled Schultz van Haegen-Maas Geesteranus. There are also perhaps some surnames to be avoided. Going on kraambezoek – the Dutch have a word for visiting a new mother and her baby – is an institution. Expect all sorts of people – including your boss – to drop round with a soft toy for the baby – when you would much prefer a bottle of whiskey. If you wish to discourage visitors at certain times, you can include this on the birth announcement card. ‘Charlotte and Emma are resting between 2pm and 4pm,’ might not mean you are actually dozing off but will give you a couple of hours to catch up on the laundry. Beschuit met muisjes are traditionally handed out at work by new dads. Take a Dutch crispbake, spread it with margarine and pour on the aniseed sprinkles – blue for a boy and pink for a girl. It is very rude to refuse beschuit met muisjes when offered by the proud parent. The Netherlands by Numbers crew know of one foreign worker who had to empty half a drawer full of pink and blue crumbs when she left her job. Perhaps worse than a ‘baby on board’ sticker? 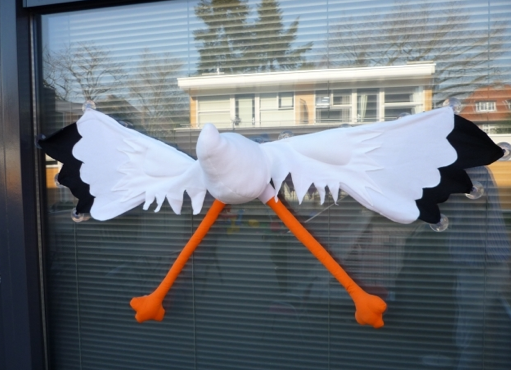 You can often spot households where there is a new baby by the wooden stork in the garden or smashed into the window, or the pink and blue bunting. 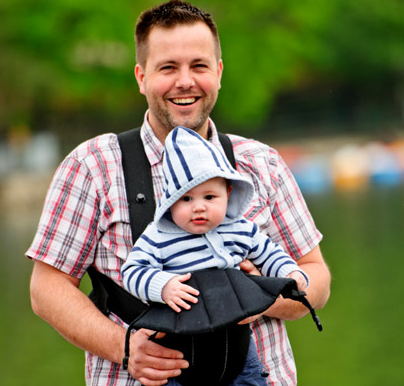 Papadag is the increasingly popular term to describe the day of the week which some fathers take off from work to look after their offspring – often as part of the paternity leave allowance. According to the national statistics office, around 13% of young fathers take advantage of their legal rights to spend one day a week looking after their children. Mothers complain that the washing, ironing and other chores never get done on papadag. Who cares about the cleaning? Surveys by the United Nations and others repeatedly show that Dutch children are among the happiest in the world. So you’ve picked the right place to reproduce. And just for good measure, here is our list of things foreign children love about living in the Netherlands as well. This entry was posted in Uncategorized on March 26, 2014 by europeansinthenetherlands. Regarding naming, If you already have a child, the newborn must have the same surname of the older. My older child has both mine and my wife’s last name, then my younger, that was born in the Netherlands, also has. She was born in hospital and the nurse asked me if we wanted to keep the placenta. Parents of a newborn baby are always offered the placenta because many people like to bury it in their garden and plant a new tree or rosebush on it, to honour their new familymember. Just wondering if you can add additional words to your baby’s surname (e.g. if father is called Robson, he wants to add Johnrobson as his child’s surname to honour, his grandparent or something of that sort..)? What would you suggest then to happen to the placenta at home birth? that the midwife brings it home? according to the law it is the property of the mother. It is absolutely not difficult to get the father’s name on the birthcertificate ‘if you are not married and a foreigner’ The father is basically who the mother says it to be. Wether that will hold up in court in a paternity suit is another thing. I live in the U.S. and my fiance lives in the Netherlands and she’s 7 months pregnant. We are going through the K1 Visa process now. My question is, can my child have my last name at birth in Netherlands with out me being present? Someone please help me with this!